When Clare was very sick and confined to her cell, she began to see the convent Mass on the wall of her room as if she was present there herself. Pope Pius XII in 1958 proclaimed her patroness of television. St Clare, Religious. Born at Assisi (Italy) in 1193 or 1194; died there on this day in 1253. From a well-to-do family, Clare embraced an evangelical way of life after hearing the preaching of Saint Francis of Assisi. Founded the order of the Poor Ladies, now the Poor Clares. Noted for her life of extreme poverty, austerity, contemplation, and charity. 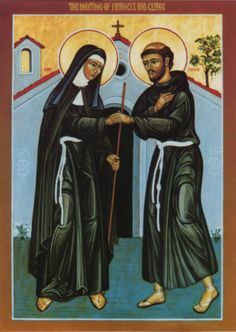 St Clare of Assisi, while associated with St Francis, is a most inspiring saint in her own right, with a great sense of her own dignity as a woman. Unaffected by the power of bishops and popes, she insisted on having her own rule approved despite enormous pressures. Patrick Duffy tells her story. Chiara (English: Clare) Offreduccio was born in Assisi, 12 miles east of Perugia in the Italian province of Umbria. She was the eldest daughter of an aristocratic family: her father Favorino was Count of Sasso-Rosso and her mother Ortolana was a devout woman who had been on pilgrimages to Rome, Santiago de Compostela and the Holy Land; later on in her life, Ortolana entered Clare’s monastery. Chiara would have been a young girl when there was a civil war between aristocratic and republican families in Assisi. She would have known Francesco Bernadone though he was older than she was and he was of a republican family. She would have known he was imprisoned in Perugia and that later in the piazza before the cathedral he stripped off his clothes and handed them back to his father renouncing his earthly heritage, saying: “From now on I desire only to say ‘Our Father who art in heaven'”. All this and Francis’s early preaching about poverty made a profound impression on Clare. When she was about eighteen and her parents were making arrangements for her to marry a wealthy young man, on Palm Sunday Clare by previous arrangement with Francis, put on her best clothes and went to Mass. In the evening after dark she changed into simpler clothes and went to where Francis and the Friars were waiting for her at the Portiuncula outside the city. Here Francis received her into religious life and cut off her beautiful hair. At first he arranged for her to stay at a nearby Benedictine monastery of nuns, San Paolo delle Abadesse. Her family came to take her back, but Clare clung to the altar cloths and would not go. As they grabbed her, she pulled off her veil and the shock of seeing her bald head convinced them to leave her be. As the Benedictine abbey would have been quite aristocratic, and not quite suited to Clare’s temperament, soon Francis arranged for her to go for a short period to a house of female penitents, Sant’Angelo in Panza on Monte Subasio. It was here that her younger sister Catherine, joined her, taking the name Agnes in religion, but soon Francis moved them again to the church of San Damiano, just outside the walls of Assisi. This was the small church which Francis himself had rebuilt in response to a vision. Here other women joined them, and San Damiano became symbolic for its radical poverty and austere lifestyle. The women were at first known as the “Poor Ladies”. Francis, a deacon and never ordained a priest, at first directed the order himself. 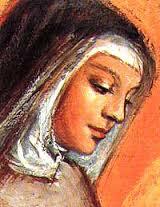 Then in 1216, Clare accepted the role of abbess of San Damiano. As abbess, Clare had more authority to lead the order than when she was the prioress, having to follow the orders of a priest directing the community. When Francis set up Clare’s community of nuns, he did not give them a formal rule but only guidelines for the religious life. But soon after that Cardinal Ugolino dei Conti di Segni, a supporter of the Franciscans, who later became Pope Gregory IX, gave them a rule which tried to bring them into the mainstream of religious life. This rule made provision for the nuns to own property and to make sure they had a regular income. However, this was totally against the radical poverty that Clare wanted and she stubbornly refused. Some time later when he became pope, Gregory IX drew up the Privilegium Paupertatis, a document which gave the nuns the privilege of poverty, allowing them to live entirely on alms. This was not fully what Clare wanted, but it was an important concession. She did not want it as a privilege, but written into her rule. 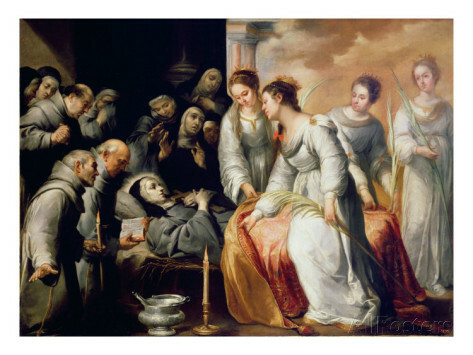 It was only when Clare lay on her deathbed that the new Pope Innocent IV came to San Damiano personally and handed Clare a papal document, Solet Annuere, approving Clare’s own rule. Clare kissed the document in appreciation. Clare’s clarity of mind and the force of her spirit influenced her community and she helped set up other monasteries in Italy, France and Germany. The sisters worked with their hands, spinning and weaving to make cloths for the churches and caring for the garden, but it wasn’t a commercial venture. Clare wore a hair shirt and fasted a lot, but later, when she became ill, she let go of these practices. She was the prayerful servant and inspiration of the other sisters, tending them when they were sick. She was in correspondence with Agnes of Prague who set up her own community with a similar radical poverty. But because of the severity of the life of her community – bare feet, sleeping on the ground and speaking as little as possible – others avoided them. In 1244 the Holy Roman Emperor Frederick II was at war with the pope. He marched an army into Umbria and among his soldiers he had a large detachment of Saracens to terrorise Christians. While Frederick’s army besieged Assisi, the Saracens headed for San Damiano. 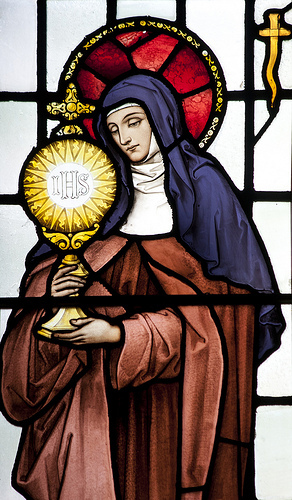 Clare carried the Blessed Sacrament in a pyx or a monstrance to the wall of the convent asking God to “defend those I cannot protect”. She heard a voice answer, “I shall always protect them”. When she stood up, she saw the Saracens riding off into the distance. She asked the sisters to pray that Assisi would be spared and the next day the emperor too withdrew all his soldiers. In her later years Clare was confined to bed and could not attend Mass. The sisters had all gone off to Matins. Clare sighed, saying: “Look, Lord God. I have been left here all alone with you”. Then she began to hear the organ and the Office and Mass and to see it on the wall of her room as if she was present there herself. Probably with this miracle in mind Pope Pius XII in 1958 proclaimed her patroness of television (Apostolic Letter 21.8.1958). It is interesting that an American Poor Clare nun, Mother Angelica, founded what is probably the foremost evangelising television network in the world, the Eternal Word Television Network (EWTN). When in the summer of 1253 Clare lay dying, bishops and cardinals came to see her and the Friars sat at her bedside reading the passion of Our Lord according to St John. She died holding her papally approved rule in her hands. Pope Innocent IV who had approved the rule was to say the Mass. When the friars and sisters intoned the Requiem, he told them to sing the Mass of a Virgin Saint instead. Everybody hesitated. That would be to publicly declare her a saint. One of his cardinals advised the pope it would probably be more prudent to sing the accustomed Requiem. He agreed, but the process began immediately and she was canonised two years later. A new basilica of St Clare was constructed and in 1260 her remains were transferred to it. Her skeleton can be seen there today. Ten years after her death (1263) Pope Urban IV promulgated another rule that did not have the radical poverty option, so there have been two Poor Clare observances from that time. See http://poorclare.org/blog/?page_id=4 . Clare’s biography written by Thomas of Celano, lost since the 16th century, was recently recovered. Today in Ireland there are Poor Clare monasteries in Belfast, Carlow, Cork, Drumshanbo, Dublin, Ennis, and Galway. There are Sisters of St Clare with a Generalate at Harold’s Cross and convents in the dioceses of Armagh, Dublin, Down & Connor, Dromore, Kerry and Kilmore. 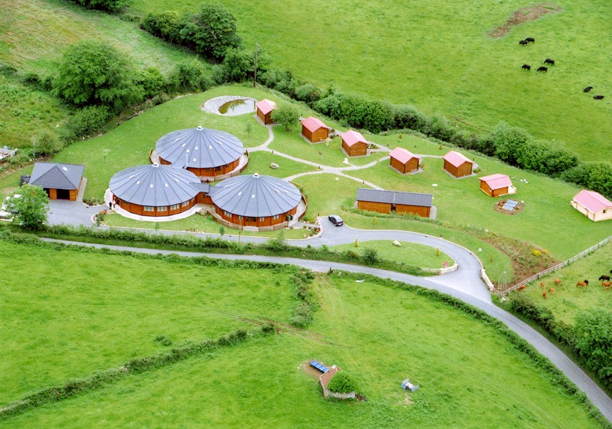 There is also a new monastery recently opened in Dundalk, Ireland.